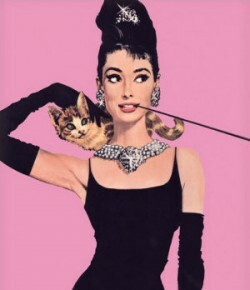 Day 5 Spring Wardrobe spruce-up: Closets closets closets closets | What would Audrey wear? 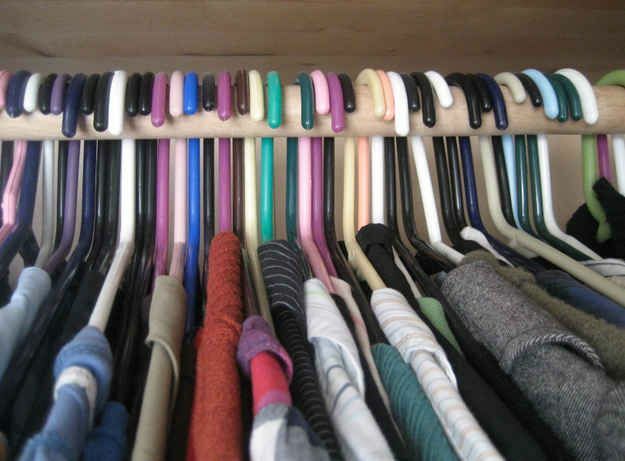 1) If you’re not exactly sure if you’ve worn certain garments in a while, turn all of your hangers around backwards. When you use an item, turn it back the usual way. This way in a month, or two, or six (whatever predetermined timed works for you) you can really see how much of your wardrobe is being used, and consign, donate, or make plans to wear what you don’t use. Simple, but effective! 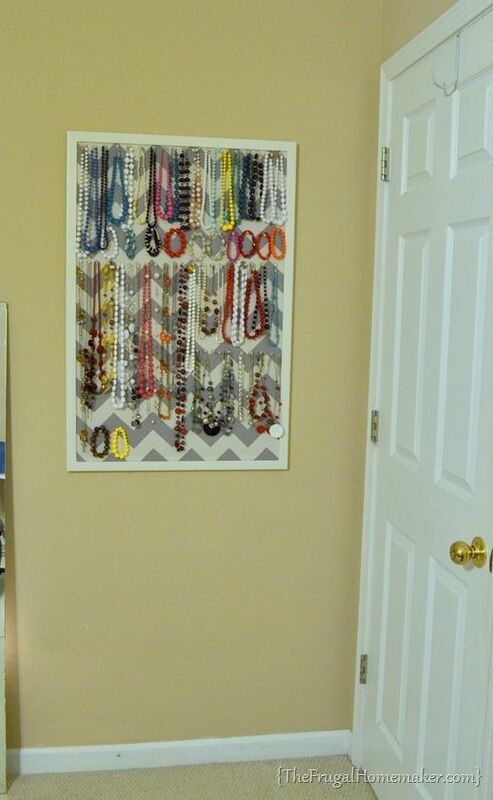 2) Display jewelry somewhere you can admire it and be more likely to wear it: maybe on a dresser, on hooks on the doors of your closet, or on a specially made picture frame holder like below. Jewelry is such a great way to change an outfit and make it more interesting, and most of us own a lot of jewelry. The trouble is remembering to actually wear it! 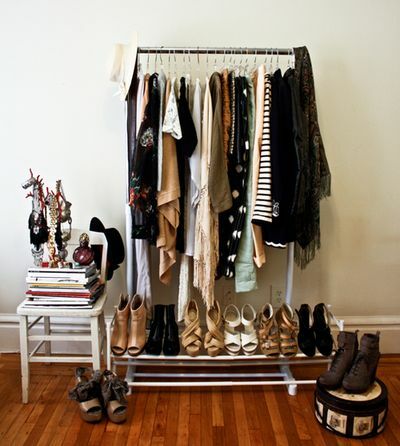 3) Have a wardrobe staging area. This is my most important tip for quick changes and hectic mornings. 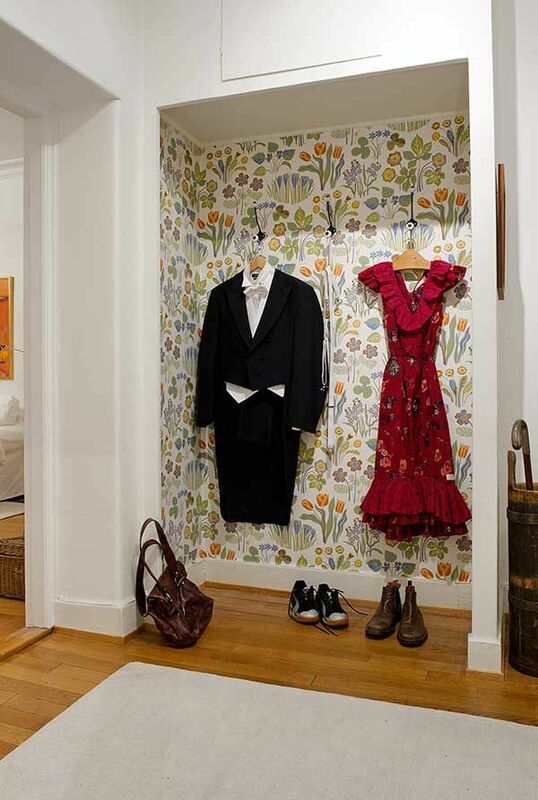 Put up a curtain rod, curved shower curtain rod or hooks in your bedroom or in your closet if it’s big enough, and always keep 3 outfits completely assembled there and ready to go. Choose your base, accessories, underwear and shoes, put them all together on or below the hanger so you can see how they look without having to try them on together, AND so you can grab the whole thing in a pinch. Putting your outfits together in detail ahead of time will ensure you dress more creatively, that you’ll catch little repairs your garments need more easily, and that you end up liking what you wear every day. Try it out, I guarantee it will make a difference!